Development & Performance component of the Club Recognition Program. Swimming Star Times Data Base will be used in combination with the Hy-Tek Single-Year Age Group Power Point system. The program scores single age groups from 11-16 years old and has a combined 17-18 age group. 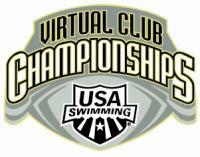 After all eligible swims have been scored using the power point system, a team score for each registered USA Swimming club will be calculated. The tabulation will occur once every evening. Team Event Limit: Each team will be limited to two entries per event by age group and gender. The program will automatically tabulate which two events in combination with other teammates produce the highest team score.Individual Event Limit: Each swimmer will be limited to four events. A swimmer may contribute only four times per season even if they age up (i.e. may have two times selected as an 11-year old and two as a 12-year old, but not four as an 11-year old and four as a 12-year old). The program will automatically tabulate which four events in combination with other teammates produce the highest team score. For larger clubs, the computer will go through more than 1,000,000,000,000 (1 Trillion) calculations to determine the optimum score! 13, 14, 15, 16, 17-18 year olds – All recognized Olympic events (13 events). This means for Women the 1000y/800m freestyle and for Men the 1650y/1500m will be the long distance event scored.